It’s been two weeks since Linden Lab introduced the new pricing structure for private regions, and as Tyche Shepherd reports, her Grid Survey shows the grid has experienced its second consecutive week of net private region growth since the change came into effect. In the week immediately following the introduction of the new pricing structure (Monday July 2nd through Sunday July 8th), the SL grid saw a net increase of 34 private regions, while in the week Monday July 9th through Sunday July 15th, the net increase was 35 private regions. 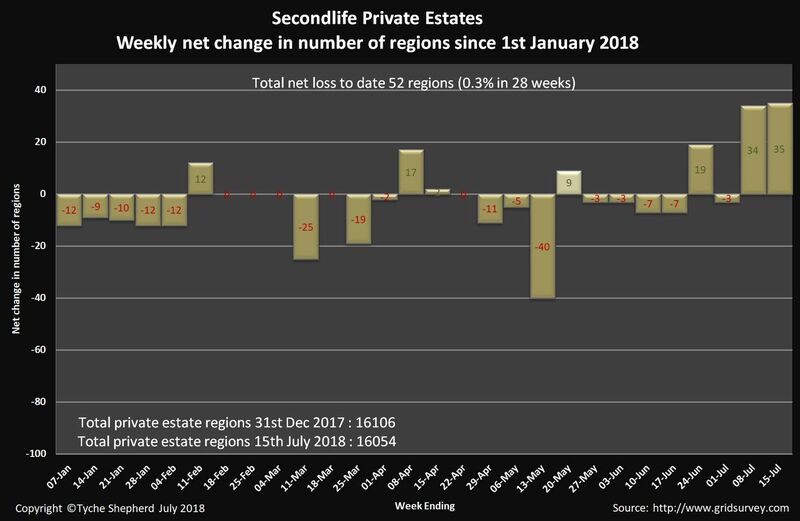 As Tyche indicates, these increases have helped slow the overall rate of private region attrition to just 0.3% – a net loss of 52 private regions between January 1st, 2018 and July 15th, 2018. By comparison, some 326 private regions were lost to the grid between January 1st and July 16th, 2017 (with an overall net loss of 667 private regions through the entire year). So, have regions losses turned a corner as a result of the price change? Frankly, it is too soon to tell; two weeks is only two weeks – we need to see how things trend out over a longer period before anything can really be determined. A lot here will depend on how much of the tier reduction land rental businesses pass on to their tenants in order to make private rentals more appealing; something I noted in passing in Looking at the new private region and L$ fees. Plus, a simple count of region growth isn’t the entire story here. Simply put, the private region pricing restructure will have seen the Lab take a reduction in monthly revenue generation. It’s questionable whether such a modest increase in region numbers, even when coupled with other options for increased revenue generation such as the Mainland price restructuring (with its possible attendant increase in Premium subscriptions) and the US $0.50 increase on L$ purchase transaction fees, has wholly overcome the immediate deficit of the tier rate cut. Thus, while the uptick in private region count is a positive turn, it is too early to be celebrating. We’ll need another 4-6 weeks before we can start to get a genuine feel for how things are going as a whole. It will also be interesting to see how long new regions entering the grid remain in place or whether we see some rapid comings / goings month-to-month. I’m also curious as to how the restructuring affects the Full / Homestead product ratio on the grid, so will be looking to see if Tyche can provide some updates on this in the coming weeks / months. In the meantime – and totally off-topic as far as private regions are concerned – I wonder if Tyche has had time to have a bop around Mainland to see how the abandoned land situation there is fairing? As of January 2018, abandoned land stood between 22% and 23% of all Mainland; it would be interesting to see how it now stands, some four months on from the Mainland price restructuring. The Quinquina RC viewer updated to version 5.1.7.517594 on July 12th.